Run For Fat Loss is a training plan from runkeeper. I haven’t made any adjustments to the plan other than adding in strength or cross-training on my days off. I’ve put the most recommended cross-training suggestions for runners below with some helpful links. I’ve also added in some notes on what each run should really look like. I will be updating this page later with the actual spreadsheet I put this in so you can make alterations. I’d recommend going to the website from runkeeper to pull the plan up with more specific details on each run. Thanks Mike Deibler M.S. 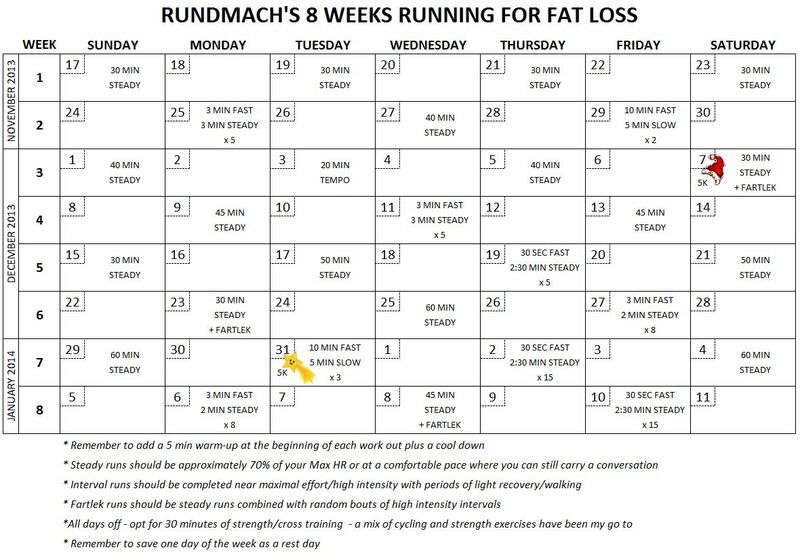 for sharing this plan as I have added it to my calender and threw in a few of myraces in the calendar. See below to see what my hopeful plan is to lose some fat in 8 weeks will look like. Right now I’ve already completed the first 4 weeks and have lost 5 pounds! 🙂 Let’s see if I can keep losing and not gain too much over the holidays. As most people know cardio, such as running, is a crucial component to a fat loss program. What people do not understand is what type of running should be done and how to create an effective fat loss running program. If you have been running for a while and have not seen the results that you are looking for, then the R4FL program is a perfect fit for you. This program was designed with some of the best fat burning workouts you can do. All of the methods used in the program have been demonstrated with numerous research studies to be the MOST effective way to burn more calories. This program is best fit for someone who has already some experience with running. Try various weight exercises, cycling (stationary or outdoor), pool running (if you have the luxury), swimming, etc. Any kind of physical activity that uses similar muscles as running except for running on your days off would be extremely beneficial. 1. The Basic Plank- Hold for 30 seconds, relax and repeat. Gradually increase the number of repetitions and the length of time. 2. The Side Plank- Hold for 30 seconds, relax and repeat. Gradually increase repetitions and time. 3. The Superman Pose- Lie face down. Raise one arm off the ground and hold for 20-30 seconds. Release and raise the other arm. Then move to your legs; hold one leg at a time off the ground. Then, try holding an alternate leg and arm off the ground at the same time. Then, try both arms up at one time and then both legs at one time. The most advanced version is holding both arms and legs off the ground at one time; hence the name Superman Pose. Hold each of these poses for 20 to 30 seconds, relax, and repeat. 4. Abdominal Crunches- Lie on your back, knees bent and bring your chest towards your knees. Keep shoulders back and chin up. Repeat. 5. Abdominal Crunches with a Twist and/or Bicycle Legs- Do the abdominal crunches as stated above but include a Twist to work the oblique muscles. Keep knees bent, feet on the ground. Bring shoulder to opposite knee for a twisting motion. Another version is the bicycle, which is knees bent, feet off the ground and bring opposite should to knee at the same time, alternating legs to elbows.